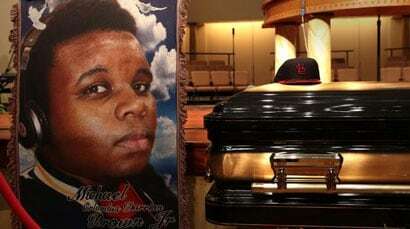 Recently released results of forensic testing prove that a struggle occurred in the patrol car of Ferguson police officer Darren Wilson before the officer fatally shot 18-year-old Michael Brown. The tests, which were conducted by the Federal Bureau of Investigation, determined that blood found on the inside of the car door, as well as on Wilson’s gun and uniform belonged to Brown, The New York Times reported Friday. The test results corroborated the story told by Wilson that a struggle over his service pistol occurred inside his patrol car, prompting the first shots to be fired. The tests determined that two shots were fired inside of the patrol car, one of which struck Brown in the arm, the other missed Brown. Wilson also maintained that Brown, who was easily the size of a pro football player, physically assaulted him, punching him in the face and scratching him repeatedly. According to Wilson, the attack left his face swollen and his neck cut. But not everyone agrees that Wilson’s account of what occurred that day is accurate. Some witnesses said Wilson executed Brown in cold blood as the teen held his arms up in the air while standing in the middle of the street, while others said some sort of struggle was obvious before it appeared that Brown was running off, and others still said that Brown appeared to be running toward Wilson as the officer fired. Nonetheless, Benjamin L. Crump, the attorney representing the Brown family, rejected Wilson’s claim to self-defense. Although the recent test results indicate that a struggle did in fact occur, the exact reason why Wilson fired after Brown had already exited the car still remains a mystery. However, the unnamed officials working closely with the case told The Times that at this point it seems there is insufficient evidence to charge Wilson with a civil rights violation. The grand jury has been reviewing the case since Aug. 20 and an official decision is expected by mid-November. Wilson has not been seen publicly since the shooting, which occurred on Aug. 9.